Midsummer, and we’re all starting to ooze into the fabric of our beach chairs (but today temps hit 90 again, so full disclosure: I’m oozing into my sofa as I write this). A hazy, dreamy list of the not-to-be-missed—summer delights,`a la me. 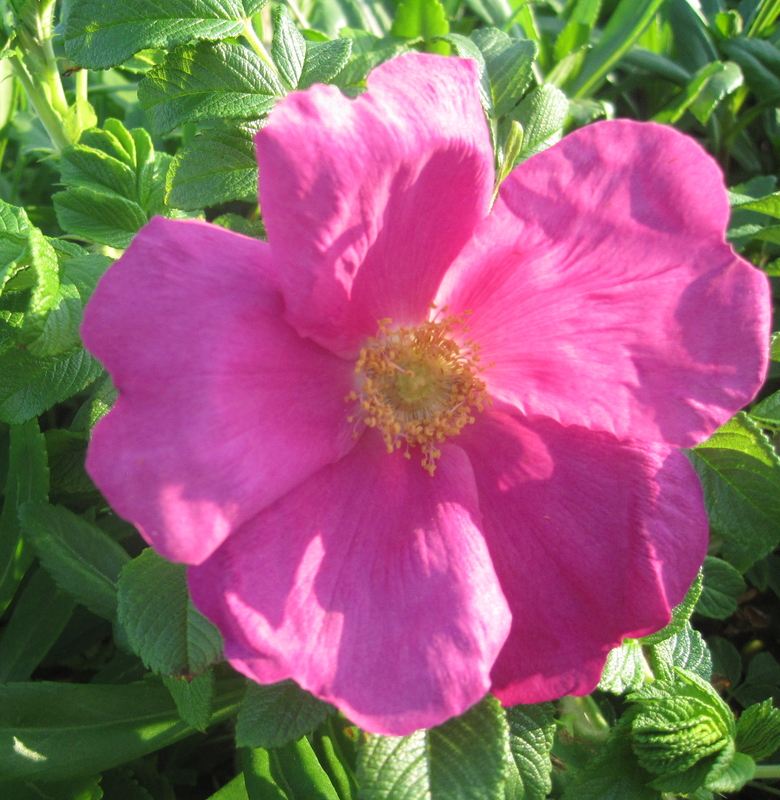 Beach rose in early evening light. 1. Go to the beach between 4 and 6p. The shadows are long, the sand has a golden glow, and the crowds have cleared. It’s the most beautiful time of day. 2. 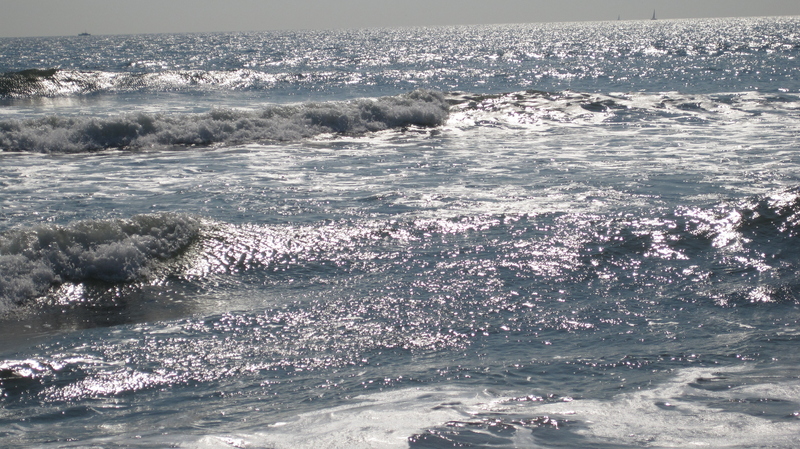 Or go to the beach between 7 and 9a when the ocean is sparkling in the morning sun. It’s the other most beautiful time of day. Dive in. You’re swimming in a big splashy tub of glitter. 3. Eat locally grown fruit, picked perfectly ripe. To get the full flavor, resist refrigerating it. Trust me on this one. 4. Don’t put fresh basil in the fridge, either. Treat it like the plant it is: Trim the ends and stick the bunch in a jar filled with water. Use as needed. If flowers start to emerge, pinch them off to keep the leaves from getting bitter. 6. Make a pie. Any sensible pie crust comes together in the Cuisinart in 10 minutes, I promise, zip zip zip, and it won’t have any weird stuff in it. Then you can add anything summer gives you—blueberries, blackberries, late-season cherries. Doll them up or leave them alone. 7. 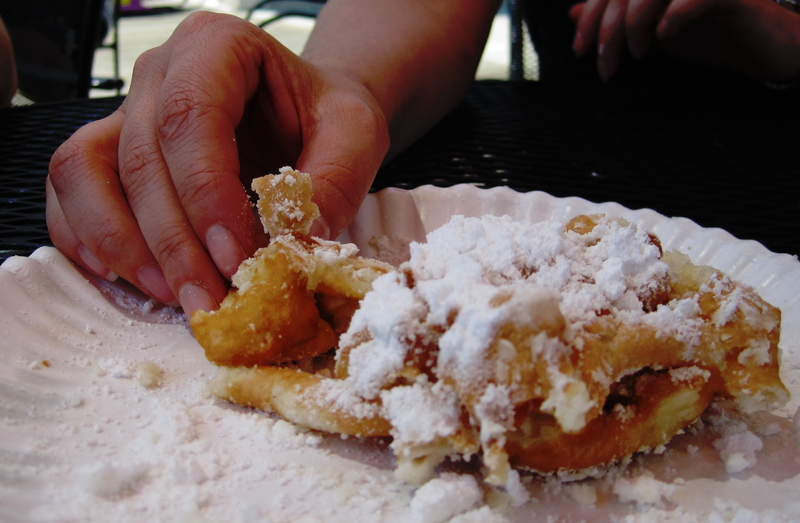 Find a funnel cake and dive into that, too. Any will do, but I like ’em puff-tastic. From the very nearby Asbury Park, NJ boardwalk. I’m not 300 lbs., and it’s miraculous. 8. Slurp up an heirloom tomato—and go local on this one as well, too, for best flavor and price. All other tomatoes will seem like the soggy tube socks they are. Slurp at room temperature. A ripe uncut tomato will live happily on your kitchen table for a few days, if you can restrain yourself longer than I can. 9. Ride your bike. It’s just as you remember—like flying. 10. Go to a playground and swing on the swings. Go at night. Even better. 11. Find an old-fashioned ice cream parlor and order something retro. The one near me, in business since 1901, offers a really sweet, really kaleidoscopically colored soda called a cherry-lime rickey. Or go back just as far as the boomers, who order butter pecan, black raspberry, and cherry vanilla. 12. Collect wildflowers and let them brighten your counter or night stand. Tiger-lilies, false Queen Anne’s lace, and many others grow in profusion in meadows and along roadsides. If you pull the latter up fully, smell the roots; they smell like carrots (a cousin). Cool, right? 13. Buy a melon from a farm stand. Be sure it’s local for best ripeness. You can eat it in slices or chop it up and make a smoothie or an agua fresca out of it. 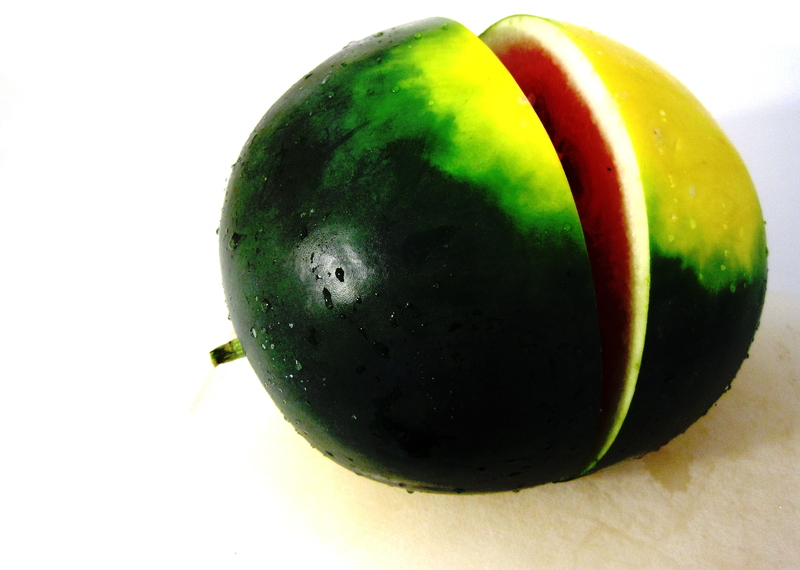 Use a knife; a melon baller wastes too much fruit. I inserted a sharp knife one half-inch into this Sugar Baby and it cracked itself right open. That’s ripe, my dear friends. That’s how melon should be, and taste. 14. Sleep with the windows open. Falling asleep and waking up to a breeze is beauteous. 15. Find something yummy growing somewhere wild and have a little snack. Then tell me about it. Don’t worry, your secret’s safe with me. *Gabrielle Reece, pro beach volleyball player, has said she isn’t ashamed of her weight—she is grateful for it, because she needs every pound to play with the force she wants. I feel the same about callouses on my feet; I’m proud of every one because I need every one. 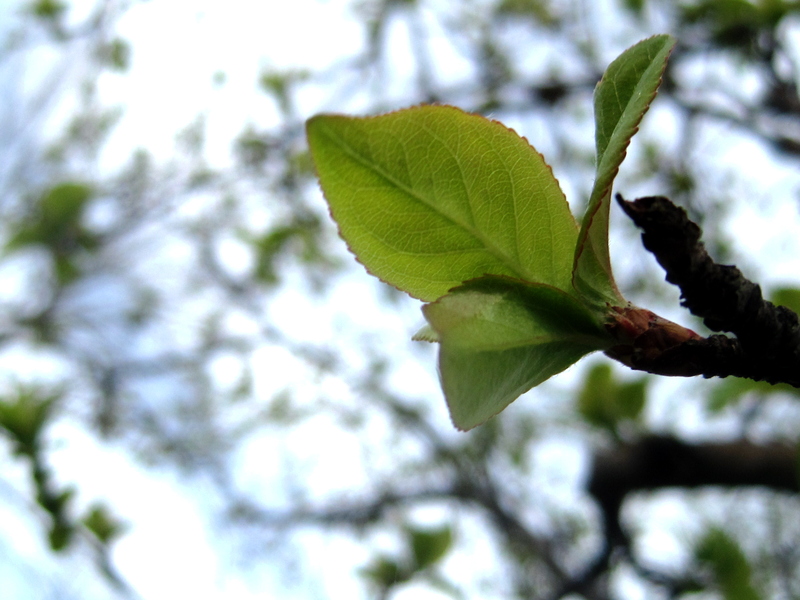 I just discovered that the edges of a crab apple leaf are the exact same red as the fruit they’ll produce in the fall. Isn’t that the coolest? Foreshadowing! You all know I can’t get enough of the outdoors. This time of year there are so many new things to see, and many of them tiny things, so you kinda have to look. I’m having very little success finding out the names of most of the flowers there. Can anyone help me out? The below ephemerals are edged in palest purple, with white on the inside. These have the form and color of a grape hyacinth, with blossoms shaped like lilies-of-the-valley. These are pure white and grow in clumps. I had to sneak onto the Schwartz family’s lawn to take this shot. Shhh now. Another clump of the above was growing a little farther down the street, and I pulled over to shoot them as well. When I did, an elderly gentleman with a big smile walked over and asked what I was doing. Of course I was terribly taken aback at his question, as most normal people routinely 1) both see and 2) stop the car to crouch in the dirt so they can shoot seven white flowers growing on the side of the road. He shook my hand with his big hand and said his name was Fred. He asked the name of the flowers, and all I could say was they’re ephemerals. 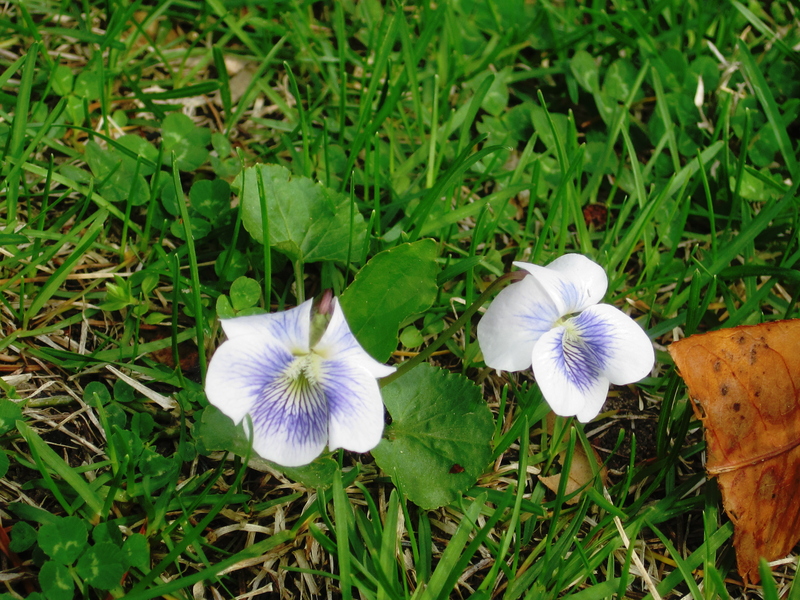 But along with living in a not-overly-manicured area, I also love having conversations with neighbors in the middle of the street about wildflowers, the neighbor’s precious patch of lilies-of-the-valley, and the dangers of overgrown ivy. Heading inside. I’m getting hungry, for a change. I bought the below this morning from a farmer who lives about five miles away. Weathered face, weathered hands, big crinkly grin. The asparagus posed for the picture just before going onto the cookie sheet and into the oven at 350 for half an hour. Just took them out, and the house smells all green. 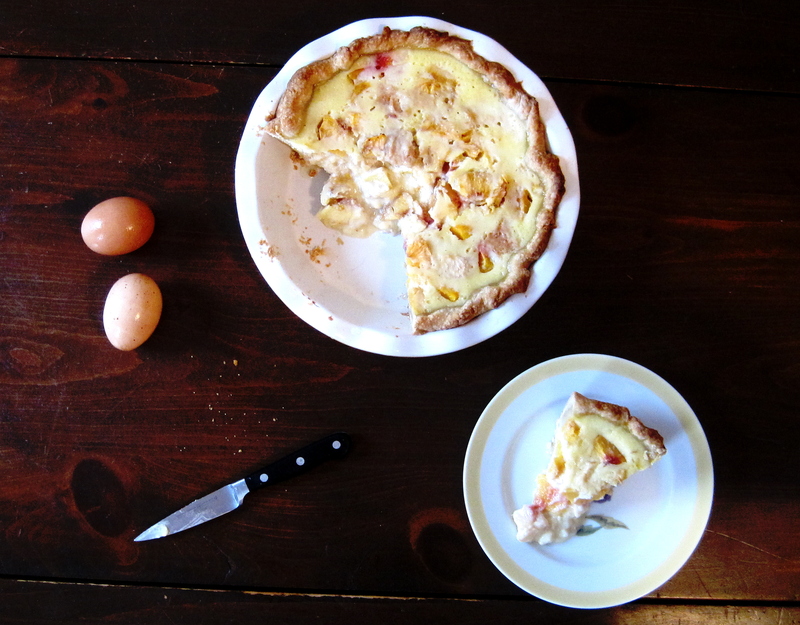 The below was a surprising triumph (except for the crust. You can see it’s way, way too heavy.). 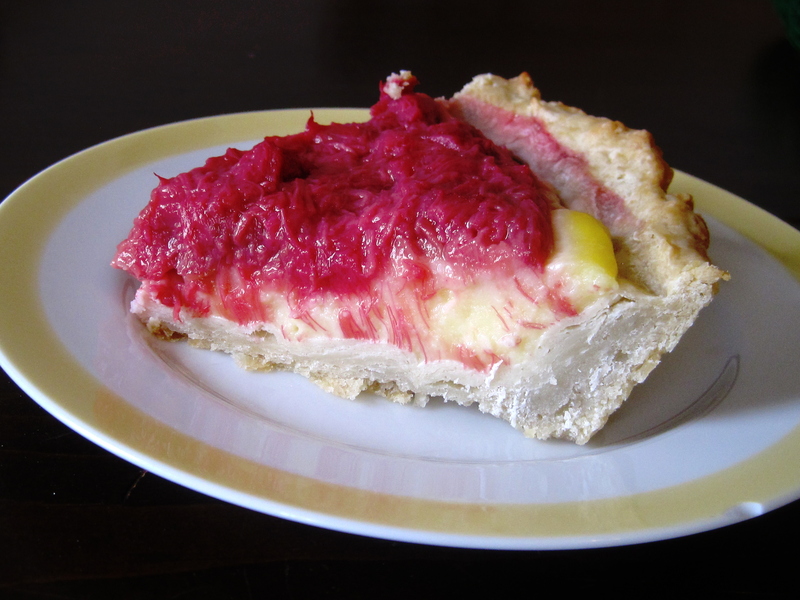 The topping came out exactly right even though I totally winged the amount of sugar I added to the rhubarb. Underneath was my vanilla custard. Good breakfast choice. Hello, whoops, back outside again. 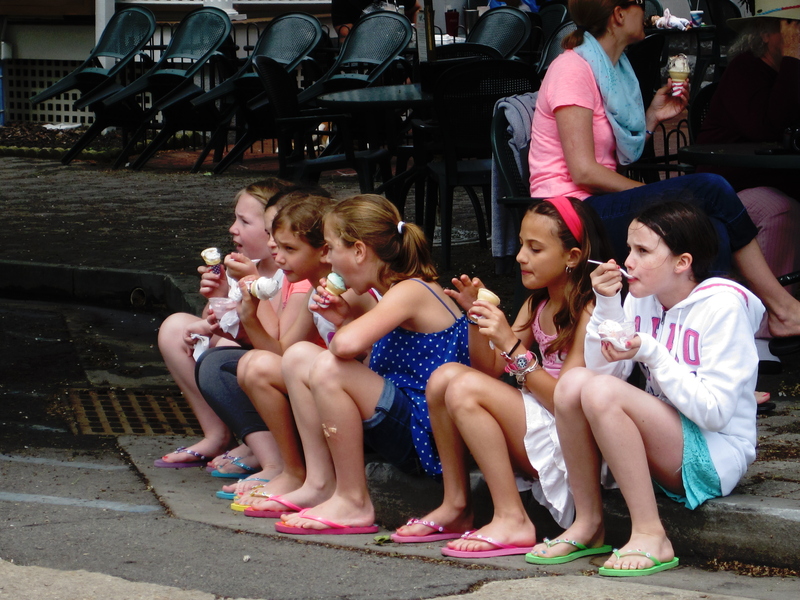 Six hungry little girls watching the crowds at the car show today in Ocean Grove. I love that they’re sitting shoulder to shoulder, like sisters, and I love that they all have on new flip flops. All different colors, no less—left to right, they’re purple, blue, yellow, orange, pink, and green. Hoping your May is as colorful, as close, and as sweet as theirs. 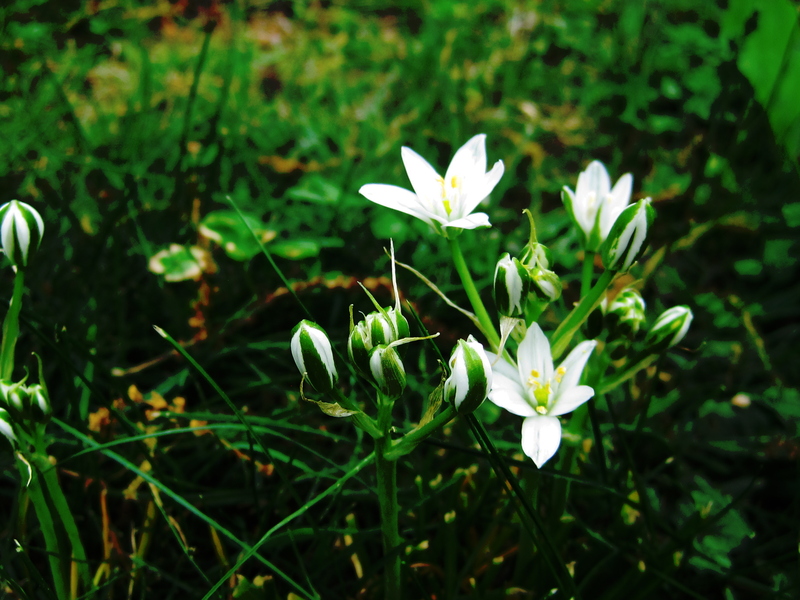 *You know the song Edelweiss, featured in The Sound of Music? Edelweiss were not just flowers to Captain von Trapp; they were a brave and constant symbol of everything he loved about his home. They were his home. 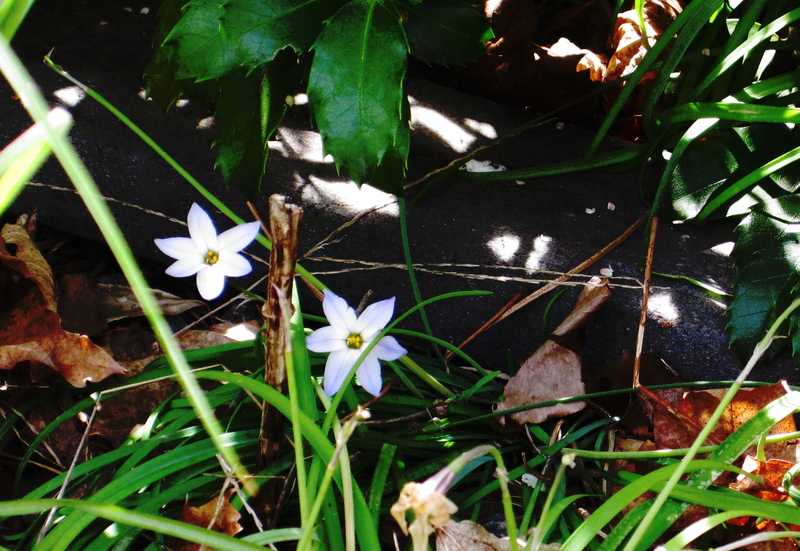 The spring ephemerals are my edelweiss.